DOHA, Qatar, 2018-Sep-05 — /Travel PR News/ — Qatar Airways Group Chief Executive, His Excellency Mr. Akbar Al Baker, addressed key leaders in the aviation industry including government officials, airline CEOs, aviation industrialists and senior dignitaries among others, as part of the International Aviation Summit, a two-day event taking place in New Delhi, India. H.E. Mr. Al Baker spoke at a panel discussion titled, ‘Can India be a global aviation leader?’ alongside India’s Minister for Commerce and Industry and Civil Aviation, the Honorable Shri Suresh Prabhakar Prabhu, as well as the CEOs of KLM, Kenya Airways, Spicejet and Jet Airways. The panel discussed the aviation operating environment in India and the opportunities that exist for the market to become the third largest globally by 2025. H.E. 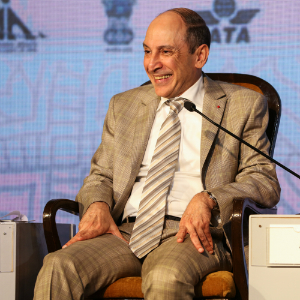 Mr. Akbar Al Baker, said: “I am honoured to have been given the opportunity to share my views on the future of the Indian aviation market at the International Aviation Summit in New Delhi. The State of Qatar and India share a substantive and strong relationship that has evolved over the years, making India an important market for Qatar Airways. This is reflected by the 102 weekly flights we provide to 13 destinations across India. In June 2018, H.E. Mr. Al Baker commenced his duties as the Chairman of the Board of Governors (BoG) of prestigious global aviation industry body, the International Air Transport Association (IATA), for a one-year term. H.E. Mr. Al Baker is the 77th chair of the IATA BoG. Qatar Airways introduced its revolutionary Qsuite Business Class services on the Mumbai and Bengaluru routes in July 2018, both of which are being served by a Boeing B777 aircraft. The Qsuite features the industry’s first-ever double-bed in business class. Sliding panels allow passengers in adjoining seats to transform their space into private cabins so business colleagues, families and friends can work, socialise and dine together during the flight. These revolutionary features led Qatar Airways to win the ‘Best Business Class Seat’ and ‘World’s Best Business Class’ awards at the 2018 Skytrax World Airline Awards. Qsuite is currently available on select Qatar Airways’ Boeing 777-300ER, Airbus A350-900 and A350-1000 aircraft. The launch of Qsuite to Mumbai and Bengaluru follows the introduction of the product to various destinations around the globe, including London, Paris, New York, Chicago, Houston, Shanghai and Canberra. In February 2018, the award-winning airline introduced its state-of-the-art aircraft, the Airbus A350-900 on its Delhi route. Qatar Airways was the global launch customer for this aircraft type, which features a two-class configuration of 283 seats in total, offering 36 in Business Class and 247 in Economy Class. The airline’s Cargo division, Qatar Airways Cargo, currently operates a total of 27 weekly freighters to the Republic of India. The top three cargo destinations in India are Delhi, Mumbai and Chennai, with five weekly frequencies to each. Qatar Airways currently operates a modern fleet of more than 200 aircraft via its home and hub, Hamad International Airport (HIA), to more than 150 destinations worldwide. Earlier this year, Qatar Airways revealed a host of forthcoming global destinations in line with its expedited expansion plans, including Tallinn, Estonia; Valletta, Malta; Langkawi, Malaysia and Da Nang, Vietnam. Qatar Airways, the national carrier of the State of Qatar, is celebrating more than 20 years of Going Places Together with travellers across its more than 150 business and leisure destinations. The world’s fastest-growing airline will add a number of exciting new destinations to its growing network in 2018, including Tallinn, Estonia; Valletta, Malta and many more, flying passengers on board its modern fleet of more than 200 aircraft. Qatar Airways Cargo, the world’s third largest international cargo carrier, serves more than 60 freighter destinations worldwide via its world-class Doha hub and also delivers freight to more than 150 key business and leisure destinations globally with more than 200 aircraft. The Qatar Airways Cargo fleet includes eight Airbus A330 freighters, 13 Boeing 777 freighters and two Boeing 747-8 freighters. This entry was posted in Airlines, Festivals and Events, Travel, Travelers and tagged Aviation Summit, Mr. Akbar Al Baker, Qatar Airways. Bookmark the permalink.